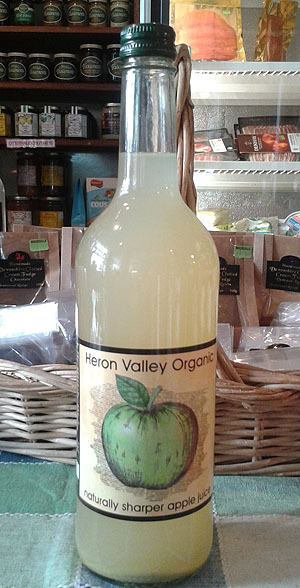 We stock a good selection of fruit cordials, organic fruit juice, lemonade and ginger beer. No concentrates, water or sugars, only whole organic apples, pears and other fruit, hand washed and pressed, before being bottled by hand and pasteurised. There is approx 4lb of organic fruit in every 75cl bottle and a smidge of Vitamin C, nothing else. Made only 4 miles from Mackgill's! 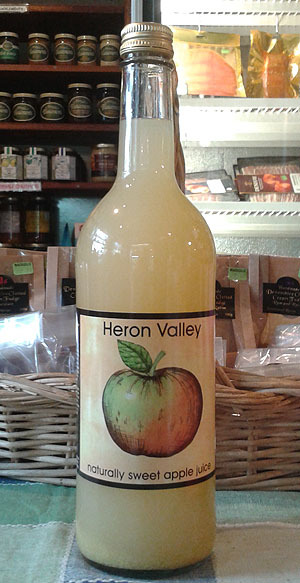 Hand pressed from whole organic apples. Gold award winners at the 2007 Great Taste Awards, 75cl. Heron Valley Apple Juice with Root Ginger. A delicious and healthy addition, fiery root ginger is added to the organic apple juice before pasteurization. Try adding vodka for a grown up cocktail, or serve long over plenty of ice for a cool summer refresher. 75cl. 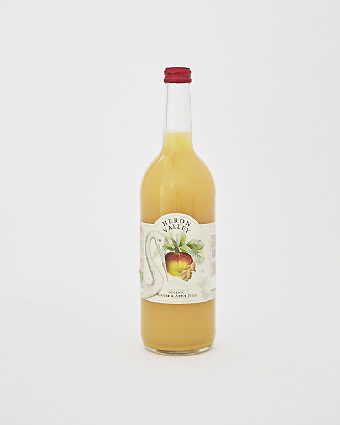 Approx 2lb whole apples and 2lb whole pears are pressed to make this delicious juice, much loved by children and those with sweet tooth's alike. No added sugars, just an entirely natural juice with a smidge of Vitamin C. 75cl. Luscombe have been making beautiful drinks since 1975. Based on a farm in deepest Devon, all their drinks are crafted with exceptional care and integrity. Ingredients are sourced direct from trustworthy growers. There are no compromises, only the best goes in the bottle. A delicious, sharp fresh citrus twist that goes with savoury or sweet dishes. Pair with Mediterranean flavours such as roasted tomatoes, olives, tapenade, pasta with roast tomatoes, grilled courgettes with mint, salad niçoise and grilled chicken with garlic and herbs. With delicate flavours, it’s a great alternative to a fruity rosé. The raspberry flavour chimes with game terrine, smoked duck, chicken or venison. Cheeses such as Brie and salads that include berries also work well. Enjoy with American-style cheesecake, particularly if topped with fresh berries, and the Scottish dessert cranachan with raspberries. The award-winning hot version – made with more spice and drier, slightly limey. Perfect for barbecued chicken, pork or anything with a sweet glaze or marinade. Or spicy Caribbean-style grilled fish - served with tropical fruit like mango. Also pairs well with Chinese food, especially sweet and sour dishes and stir-fried crab. Fresh flowers picked in full sun in May and June. Offer on any occasion when you might think of drinking Champagne. A delight with party nibbles like smoked salmon canapés, mini quiches, warm cheesy puffs (gougères) to creamy strawberry gateaux and cupcakes. A very zesty full flavoured Lime hit so a natural with Mexican food, especially tortilla chips with fresh tomato salsa and guacamole, tacos and quesadillas. Also good with simply grilled fish and chicken, prawns, spicy fishcakes and any other seafood that has been given a spicy coriander and chilli twist. Goats cheese is also a perfect match. Naturally delicious Cordials, Pressés and Fruit Crushes from Belvoir in the gorgeous Lincolnshire countryside. Belvoir Organic Ginger Cordial. 50cl. Belvoir Fruit Farms Ginger Cordial is an old favourite. This organic version of the magnificent warm and spicy drink is made in exactly the same way, but with only organic ingredients, certified by the Organic Food Federation. Made to Mary Manners' family recipe, from an infusion of freshly picked elderflowers and lots of fresh lemon juice, this has a delicate taste and makes a wonderfully refreshing drink when mixed with still or sparkling mineral water. freshly picked elderflowers from organic elder plantations, plenty of organic lemons and spring water to create this delicately scented and incredibly refreshing Pressé. If you're having a garden party on a summer's evening, this is perfect as a spritzer with white wine, or a fabulous mixer to accompany gin or vodka, or simply serve Organic Elderflower Pressé chilled as a sophisticated alternative to alcoholic drinks.